Modular construction is gaining steam, and a few key statistics show why. Check out our downloadable infographic to see the advantages of modular construction summarized in three compelling statistics. When using modular construction, 66% of building professionals sped up their schedules, and 35% managed to cut their schedules by four weeks or more. 65% lowered the cost of the project overall, and 77% lowered construction site waste. How? There are several factors are at play. Modular construction can be more cost-effective, but it often comes fairly close to the costs of traditional construction if the modules are transported long distances. The monetary value of modular construction mostly comes from the shortened timeline. Consider a scenario where a developer is creating modular apartments. If the modular apartment is completed nine months sooner, they can collect an additional nine months of rent. modular construction requires detailed up-front planning, saving time overall. In addition to preventing material loss from weather and theft. the plant setting of offsite construction reduces the likelihood of a labor shortage delaying the completion date, especially amidst the construction industry’s tightening labor market. Instead of scrambling to find subcontractors for each phase of the job, a modular manufacturer will typically employ a smaller number of full-time employees trained to create repeatable designs. The established protocols and steady labor force tend to make modular manufacturing faster, higher quality, and safer than traditional construction. Modular construction’s extended design phase also saves time. Once the manufacturer begins creating the modules, changing the design is difficult or virtually impossible. The finality of the blueprints compels developers, architects, and coding officials to have a thorough conversation before breaking ground—something that should arguably happen in every construction project. Once everyone agrees to a detailed building plan, the timeline is predictable and efficient. A student housing project in Manresa, Spain exemplifies the advantages of well-executed modular construction. With modular building techniques, a university managed to create a five-story, 44,239 square-foot building for student housing in just 10 months—an estimated 56% faster than traditional construction with a 4% lower budget. When asked about factors that drove their success, the university reported early collaboration between all parties during the three-month design phase lead to smooth execution. Statistics on modular construction become even more compelling when you consider how often traditional construction doesn’t go according to plan. The McKinsey Institute reported that large construction projects typically take 20 percent longer to finish than scheduled and are up to 80 percent over budget. Consider the resources modular construction saves when the project not only has a shorter timeline and lower budget, but also stays within that timeline and budget. 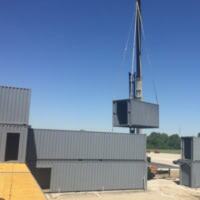 As module manufacturers for shipping container buildings, we can vouch for these advantages. We anticipate these statistics will only improve as developers and code officials become more familiar with modular construction best practices. 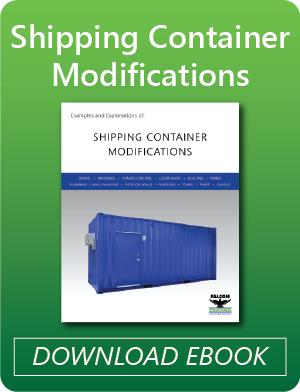 Have questions about modular shipping container buildings? Call us at 877-704-0177 or email sales@falconstructures.com.